Daniel Taylor didn't commit murder — and the author, a Pulitzer Prize–winning journalist, proved it in The Chicago Tribune. But it took the justice system more than a decade to catch up. During nearly 25 years as a reporter at the Chicago Tribune, I received hundreds of requests for help from convicted defendants. None was more compelling than the hand-printed letter from Daniel Taylor, a 25-year-old inmate at Stateville Penitentiary in Joliet, Illinois. In neat block letters, Daniel explained that he was serving a life sentence without parole for a double murder in Chicago in 1992. Even though Daniel had given a court-reported confession, he said he was innocent and he had police records that proved it. The letter was addressed to Steve Mills, my reporting partner on numerous stories about wrongful conviction. When Steve brought it to my desk, I was as intrigued—and skeptical—as he was. Why had this man confessed? How had he been convicted? Was he delusional about what the police records really showed? But Daniel’s timing was fortuitous. 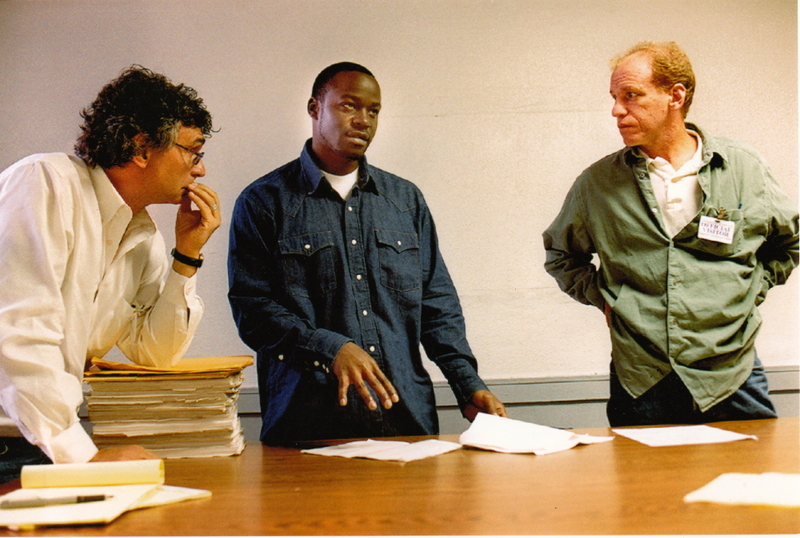 It was the summer of 2001, and Steve and I, along with fellow reporter Ken Armstrong, were deep into an investigation of false and coerced confessions in the city of Chicago. Perhaps, we thought, Daniel’s case would provide a window into a world we suspected—and later proved—existed: a world where defendants were said to have confessed to crimes they did not commit. And so, in December 2001, the Tribune published our five-part series, “Cops and Confessions,” Daniel’s case was the subject of an entire installment. We had uncovered strong evidence of Daniel’s innocence—evidence that he was actually in jail at the time of the crime and that his confession was false. I had never been so confident of a convicted defendant’s innocence. And I never imagined nearly 12 years would pass before Cook County prosecutors would admit the truth and dismiss his conviction. But it finally happened. On June 28, 2013, Daniel, who was arrested at age 17, was released at age 38, having spent more than 20 years behind bars. Steve and I first met Daniel at Stateville where he showed us the voluminous files he had gathered on his case. These files, his most valuable possessions, left with us that day. The only physical record of that meeting is a photograph taken of Steve, Daniel, and me. I framed a copy and kept it on my wall at home to remind me where Daniel was and that until he was free, an injustice remained. The story of Daniel’s wrongful conviction begins with the gunshot murders of Jeffrey Lassiter and Sharon Haugabook in an apartment on Chicago’s North Side on November 16, 1992. A neighbor heard the shots, looked out the window, and saw four men leaving, one of whom noticed her and pointed a finger in warning. The witness soon identified Dennis Mixon, a West Side cocaine dealer, as one of the men, but police couldn’t find him. Two weeks later, police picked up 15-year-old Lewis Gardner and 19-year-old Akia Phillips for selling marijuana on a street corner near the scene of the shooting. Gardner, who had an IQ of 70, told police he got his drugs from Deon Patrick and implicated Patrick in the shooting. Police said Gardner and Phillips confessed to being lookouts for the gunmen and said they also implicated Daniel Taylor, Joseph Brown, Phillips’ brother Paul, and Rodney Mathews. Daniel, who had been declared a ward of the state at age 11 because his mother was a cocaine addict, had lived in a dozen foster homes over the ensuing years. At that time, he was living in a state facility. He was picked up in December and taken to a police station, where detectives said he confessed almost immediately. His statement was transcribed by a court reporter. Daniel told us a different version. He said he was smacked in the head with a flashlight and was told that he had been implicated by others. He said the detectives told him if he gave a statement, he would be released, so he told them what they wanted to hear: that he, Mathews, Patrick, and Mixon went to the apartment to collect a drug debt owed to Mixon. According to the statement, when Lassiter said he couldn’t pay, Patrick shot him dead. Taylor and Mixon then held Haugabook’s arms and Patrick shot her as well. The woman who had identified Mixon viewed a lineup and said she recognized Daniel from the neighborhood, but that he was not one of the four men she saw the night of the murders. After the lineup, when detectives told Daniel he was being charged with murder, Daniel realized he was not being released. So he told the detectives the truth: He had been in jail on the night of the murders. A check showed that, in fact, Daniel had been arrested for fighting in a park that night at about 6:45 p.m., and jail records showed he was released about 10 p.m. and the murders occurred at 8:43 p.m. But Daniel was not released. Instead, detectives went about constructing a case to support his confession. They found Adrian Grimes, a drug dealer who frequented the same park where Daniel was arrested that night. Grimes said he had seen Daniel in the park at 7:30 p.m. that night. They found two police officers who, weeks after the murders, filed a report saying they’d seen Daniel in an alley near the shooting around 9:30 p.m.
And three months later, detectives arrested Mixon. Detectives said Mixon confessed and said that he’d seen Daniel in the park just prior to the murders—bolstering the case against Daniel. There was a lot at stake for the detectives, who said all eight defendants had confessed. Because all of them had implicated Daniel in the murders, if Daniel’s confession were to fall apart, the rest of the case would be in jeopardy. By the time Daniel went on trial in 1995, the cases against Brown and Akia Phillips had been dismissed. A judge had ruled that Brown had been arrested illegally and that detectives had made an improper promise to Phillips to induce him to confess. Another defendant, Rodney Mathews, had been acquitted. But the prosecution was still relying on Daniel’s confession, as well as the testimonies of Grimes, the officers who said they’d seen Daniel in the alley, and two other police officers who claimed that the records showing Daniel’s 10 p.m. release were unreliable. That was enough for the jury—Daniel was convicted and sentenced to life in prison without parole. We found state records, which showed that the officers who’d turned in the belated report had made false statements in their report. And we found police reports that had been turned over by prosecutors in one of Daniel’s codefendant’s cases but never been furnished to Daniel’s defense lawyer. One report said police were looking for James Anderson, who had been in the jail with Daniel on the night of the murders. There was no indication that Anderson had ever been found. By the time our findings were detailed, Patrick had been convicted and sentenced to life without parole. And Gardner and Paul Phillips had been convicted as well, and each sentenced to 30 years in prison. When it came to Daniel, Cook County prosecutors had no interest in our evidence. They stood by his original confession. Steve and I were haunted by the case. We kept at it, encouraged by our editors at the Tribune. We met with Mixon in prison, where he was serving a life sentence without parole after being convicted of the murders. Mixon told us three other men were with him at the scene of the murders, but that Daniel and the other six defendants were not among them. We found Mixon’s former girlfriend, who said Mixon had told her for years that Daniel and the others were not involved. We found a man named Willie Lee Triplett—the police hadn’t at the time—who told us he was in the courtyard of the apartment building on the night of the murders and saw Mixon and three others leave. None of them were Daniel or the other co-defendants, he said. We published more articles detailing the mounting evidence showing that Daniel—and apparently all of the other defendants, save Mixon—were innocent. In March 2003, the state’s attorney’s office said prosecutors and detectives had reviewed the evidence, but nothing had changed. The convictions were solid, the office declared. Two months later, we reported that we had found a man who said he was with Paul Phillips playing video games at the time of the murders—another chink in the prosecution’s proof. A lawyer filed a petition on behalf of Daniel, Paul Phillips, Gardner, Patrick and Mixon, seeking a hearing on the evidence we had uncovered, but the petition was dismissed. Daniel filed a petition for a federal writ of habeas corpus, but it too was denied without a hearing. Daniel’s case seemed to be at a dead end. In 2008, I left the Chicago Tribune and moved to California to work as a researcher for the Northern California Innocence Project at Santa Clara University Law School. Even there, thousands of miles from Illinois, I couldn’t forget Daniel: I still had the photograph, and it haunted me. But I took comfort in Steve’s dedication to Daniel’s case. My former reporting partner was continuing to travel hundreds of miles on his own time to visit Daniel in prison in Menard, Illinois. As a journalist who has investigated numerous cases of wrongful conviction, I’ve always believed that it’s tough enough to do prison time for the guilty, but that it’s exponentially more difficult for the innocent. Most of the innocent survive by finding comfort in God, no matter what persuasion they may have. Daniel was no exception. Over the years, I have learned that lifelines do appear. In 2008, after Daniel’s state petition for a new trial was dismissed, he turned to Northwestern University’s Center on Wrongful Convictions, where attorney Karen Daniel handled the appeal of the dismissal. When that appeal was unsuccessful, Karen decided to file another petition for a writ of habeas corpus. This was a legal longshot because of a concept known as finality — courts typically don’t allow a defendant to keep filing and filing and filing. But in 2011, the 7th Circuit U.S. Appeals took the unusual step of granting Northwestern permission to file another writ of habeas corpus. This one alleged that prosecutors had failed to disclose vital information: Prior to Taylor’s trial, police had interviewed Anderson and ignored his statement that he had been in the lockup with Taylor at the time of the shootings. “When combined with the testimony of [a] newly revealed witness and the newly disclosed police reports, this is strong proof that Taylor’s participation in the crime was physically impossible,” the decision said. By 2012, the Illinois Attorney General’s Office, which was handling the defense of Daniel’s federal habeas case, had re-investigated the case and discovered even more documents bolstering Daniel’s innocence — documents that were in the prosecutor files but never disclosed to the defense. This evidence had remained hidden for 19 years. These were handwritten notes of a prosecutor, taken prior to Daniel’s trial. The notes showed that the prosecutor had interviewed numerous police officers at the station where Daniel had been locked up on the night of the murders and several said they were certain that Daniel was in the lockup at the time of the murders. One officer, James Gillespie, said he was certain that Daniel was there until 10 p.m.—more than an hour after the murders. Despite this, Gillespie and one other officer had inexplicably testified at Daniel’s trial that the records were unreliable and that Daniel could have been out of the lockup at the time of the murders. Moreover, Northwestern tracked down a police officer who had not testified at Daniel’s trial, but who was in the station on the night Daniel was arrested and put into the lockup. The officer said that when he came on duty at 9:30 p.m. the night of the murders, he personally went to the lockup and accounted for everyone there by sight. Daniel was there, he said. Early on the morning of June 28, 2013, my cell phone buzzed with a message from Steve. He was on his way to the Criminal Courts building in Chicago where prosecutors were going to announce that they would agree to the Northwestern motion to vacate Daniel’s conviction and then dismiss the case. Hours later, Daniel was freed. I looked at the photograph of Daniel, Steve, and me. And I wept. I know a lot more about false confessions than I did when Daniel’s letter first arrived. I am now senior researcher for The National Registry of Exonerations, a joint project of Michigan Law School and Northwestern’s Center on Wrongful Convictions. The Registry lists nearly 1,200 wrongful convictions in the United States since 1989. A total of 151 of these were the result of false confessions and three out of every four involved homicides. But that’s not whole story. An additional 87 exonerated defendants who did not falsely confess were implicated by false confessions from actual or potential codefendants. This adds up to a grim total of 238 innocent defendants convicted by false confessions — cases that account for about 20 percent of all known exonerations. Cook County itself has had 92 known exonerations since 1989 – far more than any other county in the country — and, as we saw in 2001, it has a special affinity for false confessions. Nearly 40 percent of Cook County exonerations involved false confessions by the exonerated defendants (35 of 92), and an additional 16 percent were based on false confessions by codefendants. I recently traveled from California to Northwestern to meet with Daniel in person for the first time in 13 years. He hugged me—the tightest hug I’ve ever gotten—and whispered, “Thank you. Thank you. Thank you.” When he let go, I wiped away the tears and we sat down to talk. I handed him a copy of the photograph I’d carried with me all those years, the one taken at our first meeting at Statesville in 2001. He looked at it silently. “I’ve never seen that,” he said softly. Then he smiled. “Oh, man, there’s no gray,” he exclaimed, pointing to his head. He is living in an apartment in Evanston, a Chicago suburb, with his brother and his niece. He locks his bedroom at night because he doesn’t want to risk reacting reflectively by swinging punches at his niece if she surprises him in the morning. He’s learning to cross the thresholds of doorways without asking permission. He’s stopped his fastidious practice of keeping his pants under his mattress so they will be pressed with a sharp crease. Daniel went to his cell and took only his legal papers. “I left everything else behind,” he said. Then, he asked to speak to Deon Patrick, who is still in prison for the murders — and who, according to Mixon, is innocent. Daniel assured Deon he would work with the lawyers to seek his freedom, too. And then, Daniel walked outside. Sitting across from me in the conference room at Northwestern, Daniel paused to reflect. Maurice Possley is a Pulitzer Prize-winning journalist formerly of The Chicago Tribune. He is now senior researcher for the National Registry of Exonerations.